We’re busy people, so why not let others make life easier for us? I am all for finding ways to simplify things and for this I turn to people far more creative than me. Meet Life Hacks – ingenious and quirky ways to solve problems, organize items, reduce your work load and make you more efficient. It’s hard to describe them, but watch a YouTube video or look at a photo and you’ll have a why-didn’t-I think-of-that epiphany. Most of the items you need for these projects are already in your home or inexpensive and readily available. Think Dollar Store. Life hacks are a fun and funny way to describe short cuts that make life easier but not necessarily obvious. 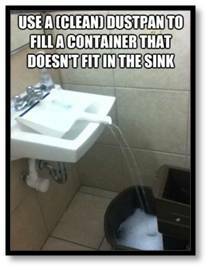 They cover everything from how to get good seats on an airplane to the best way fill a bucket that won’t fit in your sink. I like them because they’re creative and many of them take advantage of the reuse, recycle and re-purpose philosophy so important to our planet. There is something for everyone, but are they really as useful as they sound? I decided to try a few of them with a focus on better organization. I made sure they were easy, had an immediate benefit and did not waste my time. All of them worked. If you hear the word ‘hack’ and immediately think of computers you’d be right. The original definition of the term referred to quick-and-dirty computer programs that filtered, transformed and processed data streams like e-mail and RSS feeds. In today’s vernacular it’s used to describe a programmer’s unsophisticated but effective solution to computing problems, which left them more time for the fun stuff. The term hack eventually morphed into life hack; describing a solution to a problem unrelated to computers that occurred in a programmer’s everyday life. The term was first used in 2004 during the O’Reilly Emerging Technology Conference (Geek Fest) by technology journalist Danny O’Brien; referring to shortcuts used by IT professionals. After his presentation, the term caught on and spread into the tech and blogging community. The American Dialect Society voted lifehack (one word) as the runner-up for “most useful word of 2005”, right behind podcast. It was added to the Oxford Dictionaries Online in June 2011. Life hacking has become its own industry, complete with blogs, guides, web sites, e-books and Pinterest boards. If you spend any time on the internet there’s a good chance you’ve run across them, perhaps even telling yourself you’ll learn to clean your toilet that way or commit to shelling your hard boiled eggs faster and more efficiently. Nowhere is this trend more apparent than your home. The abundance of life hack ideas takes into account busy people, lazy people, disorganized people, and even introverted and socially challenged people. Got a challenge? There’s a hack for that. But what drives the obsession, and do these tips and tricks really make our lives any better? Do we save time, reduce clutter and become more organized or are we spending more time wasting time in the hope of appearing busy? I dived into the world of hacks to seek the truth. As an example, my keys hang on a rack next to the door. This is not a hack, it’s simply a solution for me—the person whose keys were never in the same place twice—and it works. I don’t want to draw a face on a tennis ball, cut a slice through the center, mount it on the wall and shove my keys inside the slash/mouth. But it just might be the ticket for someone else. That’s a hack. One man’s ceiling is another man’s floor. On the other hand, I did watch the 54-second video on how to fold fitted sheets and my linen closet is thanking me. When I saw this genius use for bread bag tags to eliminate power cord confusion I started saving mine. As a gardener, I love this clever idea for plant identification and I want to try it. Recycling and reusing are important to me, and I drink wine. How is this a life hack, you ask? This 54-second video for a garden tiki torch is the answer. It’s going to be a girl’s-night-in project. We’ll re-purpose wine bottles into a fun and useful craft project. I’ll need to start emptying the bottles now. Life hacks claim to make life easier, but not all of them are winners and not all of them will apply to you. At worst, they are entertaining and at best there are some unique ideas that don’t take much time or effort to implement. A good guideline is not spending more time on a problem than you will ultimately save. 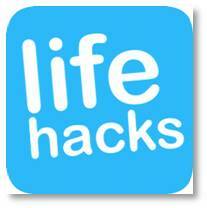 Life hacking tips and tricks will not change your life, but they will give you suggestions on how a few changes can make your life better and easier. This entry was posted in Lifestyle & Culture, Susanne Skinner and tagged American Dialect Society, cult of busyiness, Faceboook, life hack, lifehack, Pinterest, YouTube by Aline Kaplan. Bookmark the permalink. webpage? My website is in the very same area of interest as yours and my users would certainly benefit from a lot of the information you present here. Mr. Carton: Yes, you have my permission to quote my articles as long as you credit me and link back to my blog page. section 🙂 I deal with such info much. I was looking for this particular info for a very long time.